Put the pollen patties right where the bees are. They need to be able to touch the patty. Leave the wax paper on both sides of the patty. Replace if the patty starts getting hard or moldy. We are now turning the corner on winter and transitioning into spring. Right now there should be brood in a live hive. The queen should be laying. The amount of brood can vary widely from hive to hive. Several factors can influence this, available pollen in the hive, hive strength, room for queen to lay. Sometime this week, pollen patties can be put on the hive. Once pollen patties go on, they should be checked every ten days or so. If they are being consumed, replacements should be offered as needed. Do not let the colony run out of patties. This can set them back and brood could perish from lack of protein. A steady supply of pollen assures good hive development. Poor protein supply results in poor quality bees that will have shorter lives and improper glandular development. Natural pollen collection can be interrupted by an extended cool or wet weather. Keeping pollen patties on the hive assures always having a protein source for the bees. I leave pollen patties on the hive until the dandelions come out. Then the fruit bloom comes with fruit trees and ornamental flowering trees. After the fruit bloom there is usually a dearth of pollen. I normally put pollen patties back on from mid May until early June. Package bees will need pollen on the hive from the time they are installed into a hive, until early June. The introduction of pollen into the hive will kick the hive into more brood production. More brood means greater consumption of honey stores. Feeding sugar syrup or ProSweet may be required to keep the colony alive. A beekeeper needs to judge whether feeding is necessary. Lifting up the top box should give you a clue if feeding is required. If a groan is involved in the lifting process, there is probably enough food for now, in the top box. If the top box seems light, give the colony a pail of syrup. The problem that beekeepers run into is, overfeeding. This is a common problem with spring feeding. If a beekeeper feeds pail after pail of syrup on an overwintered colony, the bees will fill their hive with syrup. This will leave no place for the queen to lay and the hives population may suffer. When feeding package bees or when drawing out comb on new foundation, feeding needs to be constant until the comb is all drawn out. Not much else to do yet. Keep the winter covers on for another couple weeks. Beekeepers, we need your help now! Beekeepers, please contact your state reps and senators from your district. House bill HF-124 and its sister bill in the senate SF-218 are amendments to the existing law that prohibits roadside mowing and baling on state and trunk highways in MN before the August 1st deadline. This law was originally enacted in 1985! And passed unanimously. The current house bill with amendments to allow mowing and baling at anytime of the year without seeking permits or approval has passed the second committee and could be voted on soon. Landowners that don't wish their ditches to be mowed and baled before Aug 1 must ask for and receive approval from their local road commissioner. Please impress upon them the importance of delaying mowing until Aug 1 and it's impact for your bees, the law was passed in 1985 unanimously, preserving habitat is more important today than ever. Tell them the benefit to Minnesota's pollinators far outweighs the value of poor quality ditch hay. Tell them it is backwards thinking to allow a few individuals to profit off the wonderful ditch hay, and that people that don't want their stretch of ditches mowed and baled before aug 1 must ask for and and be granted permission to preserve their ditch habitat. Tell them we've had pheasant summits and pollinator summits in this state the last 2 years to figure out how to improve habitat, and that improving roadside ditch habitat has always been a centerpiece in these possible solutions. This is a giant step in the other direction. We are still taking orders for 2 lb and 3 lb package bees. With the cold weather coming back next weekend. I am out checking hives and putting on winter patties. This hive is Carniolans. They winter a smaller cluster. There was about three frames of bees. For Carniolans three frames of bees this time of year is fine. Carniolans just explode in population and I expect them to do fine. Three frames of bees for an Italian colony this time of year is on the weak side. A weak Italian hive with three frames of bees, should build up ok but they may not be able to divide. I added two winter patties to this colony. I will be able to feed it and add pollen patties in about two weeks. I placed the patties right where the bees are so they can touch the patties. On the first warm days in the spring, bees can be seen in bird feeders or on saw dust. The bees collect dust off of the bird seed and saw dust and pick it up as pollen. It is not pollen. Beekeepers need to be careful sawing treated lumber in early spring, the bees can possibly bring back the treated lumber dust back to the hive. Treated lumber offers protection from insects in the treatment. This dust can possibly kill a colony. This warm weather is energizing beekeepers to go out and put pollen patties on their hives and start feeding syrup. It may be a good idea to hold back for a couple weeks. This is Minnesota, the upper midwest, winter has a way of showing up again. 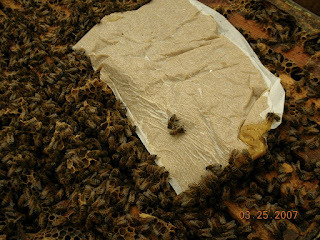 Feeding syrup and pollen, early, can get the queen laying brood at a greater amount than normal for this time of year. If the weather stays warm, a hive could get overpopulated too early and the hive may be swarming by mid April, before queens are available. If the brood population increases drastically in a hive, a cold snap could jeopardize the survival of the colony. It may be bad to stimulate the hive to get the bees rockin and rollin. Maybe a more prudent approach is called for. What can you do right now. You can check the food in the top box. Lift the box to make sure it is still heavy with honey. A frame or two of honey can be moved from another hive or from the lower part of the hive to bolster stores in the top box. Put the honey near the main cluster, do not put it in the main cluster. If the hive is low on food and the survival of the colony is in doubt, feeding syrup is the option. Better to feed than risk the bees starving. Other than that, not much else should be done. Pollen patties go on around March 1st, feeding can begin then also. The forecast for next week has possible big snow storm in the forecast. This is a post from last year. It was published by Meghan Milbrath from Michigan State. If your bees died, does it fit one of these scenario's? Do a mite check once a month May through October and one week after a mite treatment to see if the mite treatment worked. This weekend it will be warm enough to check the hives to see if they are alive or dead. You need to check. You are not letting "the heat out of the hive". We put package bees in a hive when it is in the 30's. Bee suppliers start filling up with bee orders and checking now will make sure you can get a bee order in. Don’t pull frames. You are looking to make sure there is capped honey near the cluster of bees. If you don’t see bees on top of the top box, look down deep between the frames and see if the bees are there. If you only see a frame or two of bees on top, there is a possibility that the whole cluster has not moved up yet from the lower box. If you are unsure, remove the winter cover and break the top box loose. Teeter the top box back and look between the two boxes. If you see no bees and you only had two frames up on top, I would order a new package of bees because that hive is going nowhere. If there is a big cluster under the top box, try to determine that there is honey near the cluster. The queen should be laying now and the bees can't move away from the brood. Also, if you tip that top box back, you should be able to tell if the box is heavy with honey. Right now you want to see at least three frames full of honey in the top box. Here is a YouTube video I made about checking a hive in February. I talked to Bob Sitko who teaches this class. He still has openings. This class series will prepare you for beginning your beekeeping hobby in early spring. All basics of beekeeping will be covered. Thursdays, Feb 9th - March 30th 6:30 pm - 8:30 pm. Next week according to WCCO weather, we may be having subzero weather for two to three nights. Nights like this are colony killers during the month of February. With the warm weather a week ago, brood may now be present in bee hives. The queen usually starts laying eggs in early to mid February. If the queen started laying over a week ago, a little earlier than normal. There may be a decent size patch of brood in the colony right now. When it is warm the bees may be able to move easily in the top box. Sub-zero temperatures, can pull bees off of an adjacent frame of honey to keep the brood warm. The cold forces the bees into a tight cluster. If the extreme cold lasts for two to three days, starvation can occur. Winter patties can help prevent starvation from happening. The cluster can get on the patty and consume the sugar to feed the brood if they pull off a frame of honey. The bees do eat winter patties. I put the patties where the bee are. In this case the bees were still in their lower box, so I put the patties there. This colony was light on honey and I put a shim on the hive and loaded up the winter patties. This class is offered from the University of Minnesota. Keeping Bees in Northern Climates Year 1. It is a one day class. You get a booklet on Keeping Bees in Northern Climates, and they lead you through your first year of keeping bees. It includes lunch. The class fills up quickly so sign up today. I highly recommend this course for beginners. There is also year 2. This class demonstrates your second year with bees. Also, Beekeeping in Northern Climates: Beyond the basics. 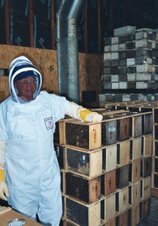 This class is exclusively for beekeepers that have had the following three experiences: 1) successfully wintered honey bee colonies in a cold climate; 2) introduced a new queen into an existing colony; 3) kept bees continuously for two years. You should take Years 1 and 2 before taking this class. If you think you know it all, take this course. You will be humbled.